When you’re feeling stressed, it’s natural to want to order a pizza and binge watch a few episodes on Netflix. (Or whatever your version of that may be!) Of course, you don’t need us to tell you that pizza on the couch isn’t the healthiest way to deal with stress. Stress is normal and we all experience it on occasion. That’s not going to change any time soon. What can change, however, is how we respond to stress. Instead of turning to substances or unhealthy behaviors, we can deal with our stress in new ways. After all, stress isn’t just about how we feel; stress can have detrimental effects on our immune system, quality of sleep, digestive system, and relationships. Let’s overcome this together! 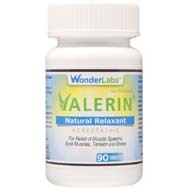 A natural herb supplement, Valerin® contains valerian root, passion flower and magnesium. A unique homeopathic treatment for stress and many of the conditions caused by it (muscle tension, insomnia, nervousness, etc. 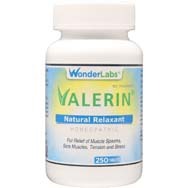 ), Valerin has offered natural relief to hundreds of thousands of Wonder Labs customers over the years. But don’t take our word for it. Read verified customer reviews for yourself. Exercise produces endorphins, which can boost your mood and help you destress. Even better, exercise outdoors for a change of scenery. Even if you just go for a walk, getting a little movement and blood flow can be a great stress reliever! If your mind is constantly bouncing from one to-do to another, keep a pen and pad of paper nearby. As to-do items come to mind, write them down. Free yourself from the anxiety of worrying about what needs to happen by writing down the tasks. Next step: break the tasks down into smaller tasks (if needed) and assign them slots on the calendar. When it’s time to get to work, get to work. When you’re free to take a break, do so, and unwind because you’ve already assigned the items on your agenda to a specific day and time… and that time is not now! For some people, unwinding from stress means getting away from everybody. However, even if you don’t feel like being around others, time with friends or family can take your mind off your own issues and help you unwind. If you can’t get together with friends in person, pick up the phone. Talk, laugh and catch up! Did you know that there are supplements for relieving stress? Ashwagandha, valerian root (discussed above), magnesium, and B-complex vitamins may help you unwind and better manage stress in a healthy way. Learn more about these stress-relieving supplements.